NO COST - Wharton Club Members Click here to Register!!! importance of ideas, inspiration, and commitment, combined with entrepreneurship and leadership of those who will soon assume regional and global responsibility for sustainable development and shared prosperity. The Global Dialogue will feature the progress and the impact of the Ideas for Action (I4A) Initiative and focus on the important role of the partnerships between government, private sector, international organizations, academia, and young entrepreneurs. 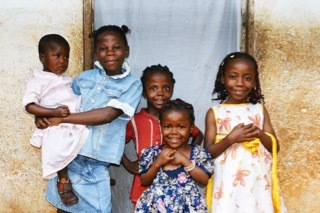 Faculty from the GWU School of Engineering and Applied Science will discuss the important role that scientists and engineers could play in generating innovative ideas in the international development space. 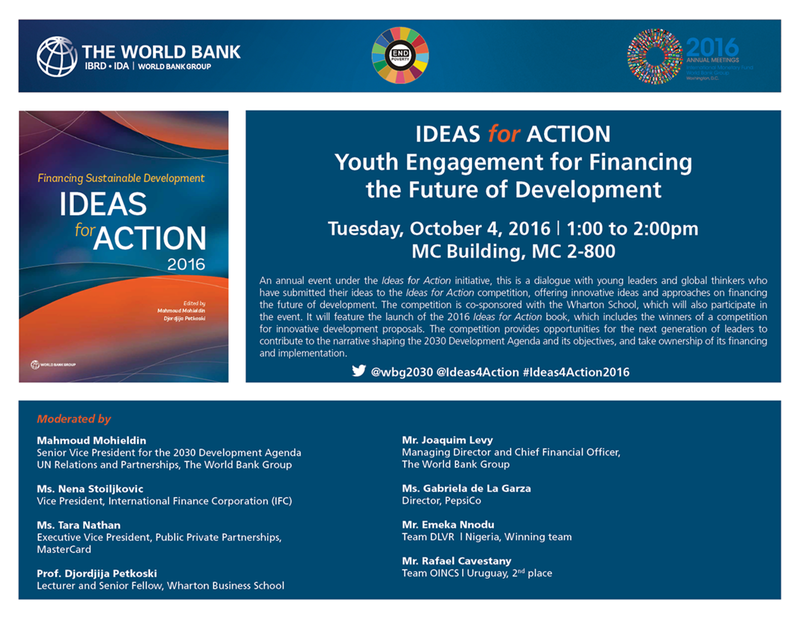 In addition, the World Bank’s new book, titled Financing Sustainable Development: Ideas for Action, 2016, will be launched during this event. Presenters will include experts and entrepreneurs from around the world, attending the dialogue both onsite and online. Representatives of the World Bank Group, academia, and the private sector as well as the winners of the I4A competition will participate in the conversation. The Global Dialogue will connect young people all over the world to discuss common issues, development, and shared prosperity. This global dialogue will be the central event organized by the Ideas for Action during the IMF and WBG Annual Meetings and involves an extensive social media campaign, before, during, and after the meetings to promote I4A and its mission. We expect to reach about 26,000 people and 110 organizations and institutions. The Global Dialogue will allow people from around the world to directly engage in the conversation and help shaping the next steps of Ideas for Action. This action-oriented activity will provide an opportunity for participants to access and share knowledge, interact with each other, benefit from the mentorship of development experts, and shaping ideas together. At the end of the IdeaLab, each team will submit a draft Executive Summary of its ideas. Registration information: NO COST - Wharton Club Members Click here to Register!! !